The Last Time: Back in the zone! Feeling really happy at the moment. I'm sticking to my 1200 cal per day. I'm so hoping to get those 2 pounds off that I put on last week, and ideally I would like to get a further pound off so I can reach my my first goal. If I manage a 3 pound loss I will be back in the 10 stone bracket again (153 pounds) and I shall reward myself with new earrings. Not that exciting but I have like 1 pair of earrings at the moment. They always seem to go missing! So it will be nice to have some new ones. I was thinking of buying a really nice pair but I think maybe if I buy cheap ones I can get lots of them! Cheap earrings used to aggravate my ears but the last couple of pairs I've bought seem okay. 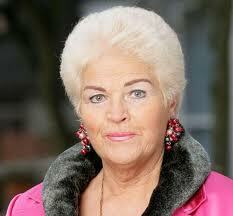 Ahh, losing weight and looking like Pat Butcher/Evans. What more could a girl want...? Aw, thank you! I will be happy if I can just get the 2 pound gain off but extra happy if I reach my first goal!